Grasp the knife by the handle allowing your thumb and index finger to rest on the blade for support. Before handling a knife, put a light to medium duty cut resistant glove on the hand opposite of the hand that holds the knife. 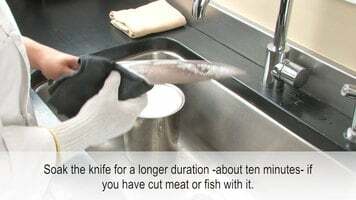 The glove will stay on the hand until the knife has been cleaned and properly stored. Use the right knife for the right job. Keep it sharp. Watch this video to learn how to clean and store knives. 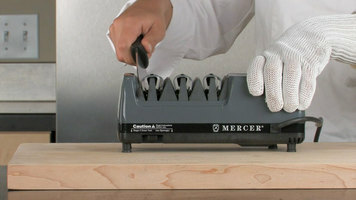 A Mercer electric knife sharpener provides great results with the added convenience of speed and consistency! To learn how this sharpener helps you achieve the best edges on your blades, check out this short video. 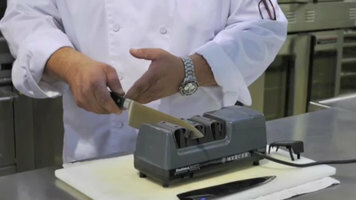 Check out this video and learn how easy it is to sharpen your serrated or straight-edge knives with this Mercer Triple Diamond electric knife sharpener. For dull knives or just ones that need to be tuned up, this sharpener is what you need!